We love our vices. They hold pipes for us to saw away at, wood while we carve, and circuit boards so that we can solder on components. So we keep them in shape by cleaning and greasing them every now and then, [MakeEverything] went even further. He found a 100-year-old vice that was in very rough shape and which was going to be thrown out and did a beautiful restoration job on it. It was actually worse than in rough shape. At some point, one of the jaws had been replaced by welding on a piece of rebar where the jaw would normally go. So he made entirely new jaws from solid brass as well as the pins to hold them firmly in place. We applaud his attention to detail. After removing all the old paint and corrosion, he painted it with a “hammered” spray paint to give it a nice hammered look. Though when he made the raised letters stand out by applying gold paint to them using an oil-based paint marker, we felt that was just showing off. The result is almost too gorgeous to use, but he assures us he will use it. You can see his process, as well as have a good look at the newly revived vice in the video below. [Kyle] came across a project which he thinks is “simply elegant”. If you don’t already have a PCB vice, here’s an easy way to build one of your own. Here’s a schematic and a couple of snapshots of [Trax’s] CAN bus hacking rig. He plans on doing a tutorial but decided to share this link after reading the first part of our own CAN hacking series. These strings of LEDs bump to the tunes. [Alex] is using GrooveShark as a frequency analyzer, then pushing commands via Node.js to the Arduino controlling the lights. It’s all planned for the back porch during his Halloween party. We remember drilling holes in the 3.5″ floppy discs (we even made a wood jig for this) to double their capacity. A similar blast from the past was to punch a notch in the larger 5.25″ versions to make them double-sided. If you’re trying to learn about FFT [Ronald] highly recommends this website. We didn’t do too much poking around because it’s kind of strange. But if you do get sucked in and have fun with it leave a comment to let others know it’s worth their attention. [Jay] was looking for a way to make his own vias on homemade double-sided PCBs when he stumbled across this post from about five years ago. The technique shown here makes mechanical vias and was developed by [Retromaster]. There’s no soldering involved, instead he uses some solid core copper wire and a press to crush it tightly against the board. The press is made from aluminum stock, with a couple of plates of stainless steel which come in contact with the board. The aluminum stock is easy to work with, but it’s relatively soft which is the reason for the addition of steel. He uses copper wire which already fits tightly in the hole through the substrate. After clipping off the excess as near to the board as possible a trip through the press leaves each side flat as shown in the inset image. We looked through some of the other projects we’ve seen from [Retromaster] like the Atari 2600 in an FPGA and this emulated Amiga floppy drive. But we didn’t see any diy boards where he used this crushing technique. This parts tumbler was easy to build but it still does a great job of rounding rough edges and polishing the surfaces of parts cut with a CNC machine. You can see that it mounts in a bench vise, and the cooling fans have a magnet which holds the tray in place on the anvil portion of that tool. Since you’re not constantly tumbling parts this makes it very easy to store the unit between uses. [Neo7CNC] mounted the wooden tumbler plate directly to the motor shaft. This is done with the help of some aluminum stock which bolts to the round wooden plate, and has a hole and set screw for the motor’s keyed shaft. 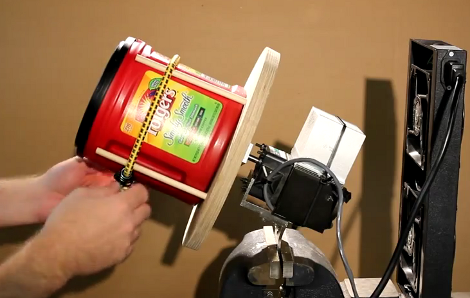 There are four wooden dowels which cradle the plastic coffee jug where the parts go. As a first test he used zinc BB’s that he already had lying around, but has put some steel ball medium on order for future projects. It’s certainly more robust and powerful than the LEGO ball mill we saw a while ago. Just be careful with motor. Even at a lowly 60 RPM it ended up getting really hot and that’s the reason there’s a heat sink and fan unit included in the build. See it in action after the break. A bench vice can be one of the most used tools in your workshop. For those that don’t have a workshop [Matt] built a vice that clamps to a table. He used scrap wood, MDF, threaded rod, washers, nuts, and wing nuts. Cheap, easy to build, and very useful!